Sometimes the mind-numbingly obvious escapes us. Or at least it does me. For years we have been selling Changeways Clinic therapy protocols from our website at www.changeways.com in hard copy format. This necessitates printing the manuals, creating the enclosed CD-ROMs with the reproduction masters for clients, then sitting and listening to CBC while stuffing the insert sleeves with the disks. But, frustratingly, Paypal in Canada (unlike the US) only allows you to define one shipping rate for a product, so we can't use it to sell copies to folks from the UK, Australia, and elsewhere. They've had to use our print-copy order form and fax it to us. And the shipping to locations overseas is exorbitant. And how do we produce the hard copies? By uploading the pdf files to our local printer. "So," anyone with two neurons that still fire would ask, "Why not make the electronic pdfs available for purchase via email?" No shipping cost, no inventory to keep, and near-instant delivery of the product. Well, don't ask me why this was never done before. My only defence is that other projects have sometimes gotten in the way of sensible and convenient upgrades to our website. USLetter, Imperial Spelling. Canada uses the same standard paper size as the USA, so our original manuals are all USLetter, but in the Imperial Spelling (or at least the Mid-Atlantic version used in Canada) that our American cousins find so quaint. Behaviour, centre, colour, etc. USLetter, US Spelling. We get a lot of orders from the USA, so we went thru the documents at nite at our center (okay, only "center" is actually correct) and altered the spelling to standard US. A4 Paper, Imperial Spelling. Most of the world uses the A4 paper format, taller and narrower than USLetter, so we reformatted our Imperial version for A4. Imperial purists in the UK may object that we don't go all the way (our program is still a program, not a programme), but we're mostly there. All versions are the same price and are emailed out the moment our Workshops and Products Coordinator comes to the office, which means within a max of 2 business days. 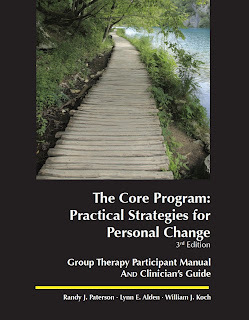 Core Program Clinician's Guide providing therapists with instruction on how to run the program, 220 pages. Quick Reference. Large font note-form reminder pages to help therapists keep themselves on track during each session. 42 pages. Goal Setting Form for Clients. Goal Setting Form for Clinicians. Thought Challenging Form, Portrait Style. Thought Challenging Form, Landscape Style. Permission to reproduce all materials designed for clients, for as many of the purchaser's own clients as they wish. The Clinician's Guide can also be reproduced for other clinicians working from the same agency at the same address. For $20, purchasers can also get a copy of an audio MP3 with eight hours of lecture content to supplement the Participant Manual. These talks can be reproduced for the purchaser's own clients as a way of supplementing the group, bringing clients up to speed when they miss a session, and as an instructional aid when using the materials with clients on an individual basis. Umm, fine, but what is the Core Program? The Changeways Core Program is a group therapy protocol for the treatment of depression. In a practical and psychoeducational format, it assists clients in the development of self-care and depression management skills. It is the most widely used depression group protocol in Canada. The delivery format is flexible, but it is most frequently used as a once-per-week eight-to-ten session closed-ended outpatient group. Some private practitioners and inpatient hospital settings have adapted it as an open-ended format. What does the Core Program cover? Identifying problems and transforming them into goals for change. Behavioural activation strategies: Breaking goals down into manageable steps. The signs, symptoms, and causes of depression. The effects of diet, exercise, sleep habits, caffeine, and drugs and alcohol. The importance of building recreation into one's daily life. Strategies for developing a more satisfying social life. An introduction to assertiveness skills. Identifying negative and self-defeating thought patterns. Learning to think in a more balanced and realistic manner. Preventing mood problems from becoming unmanageable. Where do I order that again? At the Changeways Clinic website, notably on the product page here. We also have a training workshop for clinicians interested in presenting the program coming up in Vancouver in September 2013 - information on this and all other scheduled training programs here. Plus, we are in the process of developing an online CE course for therapists on the Core Program; expect further announcements about this when it goes live. We're working on a similar distribution format for our other products, including our popular Being There Communication Skills protocol. Stay tuned.